With all the hype over the past three or four years, you would expect that disc brakes would have completely taken over the road bike market by now. The fact that this hasn’t yet happened is probably because this bike industry can’t put one foot in front of the other without first creating a whole new set of component standards. Brake manufacturers and bike companies could have easily adapted existing post-mount brake calipers for road bikes in a timely fashion, and indeed many did. But then Shimano pushed a new standard called flat-mount that better complimented the sleek aesthetics that consumers demand from moulded carbon bicycles, and the whole industry sort of stumbled. At this exact moment, there are lots of post-mount frames and forks already in existence and an avalanche of flat-mount framesets just around the corner, but not a lot of flat-mount brakesets in circulation. And there’s going to be a lot of people who have a fully built bike but are looking to either upgrade the frameset or the parts soon. So here’s a guide for readers to figure out flat-mount vs post-mount brakes. (Photo set A) Post vs flat-mount. To the left, both calipers set up for front 140mm rotors. To the right, the same two calipers set up for 160mm front rotors. In each pairing, post-mount caliper is on the left, flat-mount right. First off, when talking about hydraulic road disc brakes, the lever doesn’t matter much so long as you keep within brands (eg Shimano with Shimano). SRAM already offers flat or post calipers to match their components groupsets (eg Red, Force, etc). At first Shimano introduced only “non-series” post and flat-mount calipers as road components, but now that they’ve started branding brakes to match groupsets beginning with the new Dura Ace 9100, Shimano seemingly intends to only offer flat-mount. The 74mm spacing post-mount is a carry over from mountainbikes, for which post-mount more or less replaced the previously popular IS standard. A vast range of adapters now exist to fit post-mount calipers to various rotor sizes as well as to IS frames/forks. Conveniently post-mount allowed easier setup for different size brake rotors as well as greatly simplified adjustability for laterally aligning the caliper on the rotor. On post-mount framesets, the calipers fit natively with flanged M6 bolts for whatever smallest size rotor is intended for the frame or fork. Larger size rotors are accommodated by adapters that push the caliper out at angle away from the dropout. The calipers’ mounting slots allow for the calipers to be quickly aligned as necessary. The rear caliper mount might be on the back of the left seatstay or it could be atop chainstay inside the rear triangle. You could potentially fit rotors from 140mm to 203mm on a given dropout, which can perhaps be described as the difference between a lightweight XC setup and one rigged for downhill. Now the demands of road bike braking are somewhat different, so as long as we ignore the needs of tandem riders (and trust me, the industry does exactly that) then we really only expect to use 140 and 160mm rotors. Easy-peasy with post-mount, but them post calipers just didn’t look slick enough on carbon aero forks and those delicate-looking rear triangles that are so fashionable these days. So now we get to flat-mount calipers, which sit flush against the fork blade and on the rear, specifically limited to the chainstay inside the rear triangle. This standard makes sense for internal brake routing, because the hydraulic hose leads to the caliper immediately after it exits the frame or fork. Since only two rotor sizes will be used, the adapters to fit the flat-mount calipers are elegantly simple and only two in number total. The fork adapter is a thin plate longer than the caliper itself and affixes to the underside via two countersunk M5 bolts. Then a flanged M5 bolt goes through the adapter into the fork, from above and below the caliper. 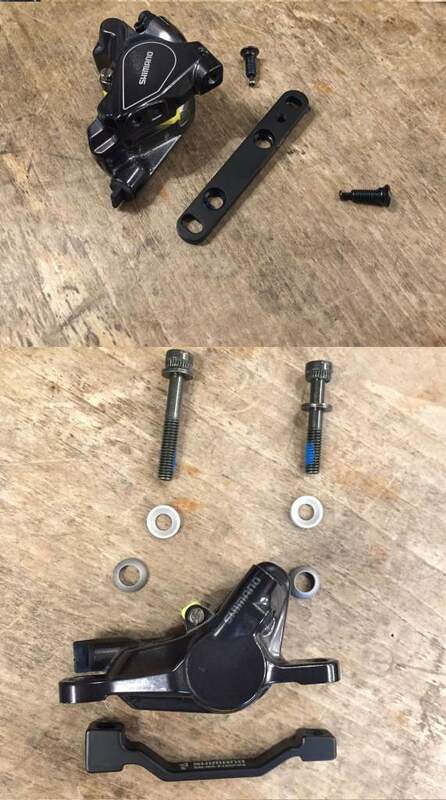 You use the same adapter for both 140 and 160mm rotors, just rotate top for bottom before you bolt it to the caliper, which changes the vertical offset. The caliper is thus positioned further up the fork for the bigger rotor. For the rear flat-mount caliper, the caliper is native compatible with 140mm rotor. Two flanged M5 bolts hold the caliper in place by reaching all the way through the chainstay from underneath. To fit a 160m rotor, a spacer fitted between caliper and stay boosts the caliper up 20mm, requiring longer bolts from the same holes underneath. All this is pretty great unless you try mixing flat-mount framesets with post-mount brakes. Look at the photos above and you can see that adapters for post-mount calipers are f***-ugly…and it can only get worse once you attach the hydraulic hose which now has a longer path outside the fork blade. It’s an especially unfortunate situation for Shimano road calipers, since they don’t have a banjo-fitting for the hose at the caliper like SRAM. At least with SRAM you can compensate for the post-mount caliper sitting in a different location by redirecting the hose path. There’s separate adapters for 140 & 160 rotors, for both front & rear positions, though the photos here only show fork adapters. (Photo set B) Left to right: Post-mount caliper on post-mount fork, flat-mount on flat-mount, post-mount caliper on flat-mount fork. All are positioned for 140mm rotors. (Photo set C) Left to right: Post-mount caliper on post-mount fork, flat-mount on flat-mount, post-mount caliper on flat-mount fork. All are positioned for 160mm rotors. (Photo set D) Top: required flat-mount adapter, fits both 140 & 160mm rotors. Bottom: post-mount 20mm adapter, converts a 140mm native mount to 160. What about fitting flat-mount calipers to post-mount framesets? Think again. No such adapters exist, and if I were you I wouldn’t hold my breath waiting for them to appear. It’s probably not geometrically possible. What if you have a frame and a fork that feature different style mounts? This is already a common occurrence with custom frames using carbon forks. For technical reasons that are a little more complex than I want to get into in this article, the flat-mount standard is rather unattractive from the perspective of steel and titanium fabrication. In fact, some of the most popular disc-specific rear dropouts available to custom framebuilders are actually IS-standard, for which standard practice currently is to use readily available post-to-IS adapters. I’m don’t know if I’m the first person to look for a flat-mount-to-IS adapter, but I’m sure to not be the last. (Spoiler alert: I haven’t seen one). In contrast, most of the carbon disc fork manufacturers seem to be switching to flat-mount as they roll out new product, though they seem slower to do so with CX-disc forks than with road disc. In the custom frame studio where I work, I’m going to see this more and more frequently. Irritatingly, there’s no solution that doesn’t make an aesthetic or practical sacrifice when dealing with Shimano. I can use post-mount calipers front & rear, but only with an unsightly adapter on the fork. Or I can use two entirely different calipers that don’t resemble each other and don’t use the same brake pads. This is only a problem with Shimano, the a**holes who invented the damn flat-mount standard. Thank you, SRAM, for making flat and post calipers for your top-three road groups which can all use the same brake pad and all have banjo fittings. I know you weren’t the one pushing for this new flat-mount standard, but you covered the bases well enough. 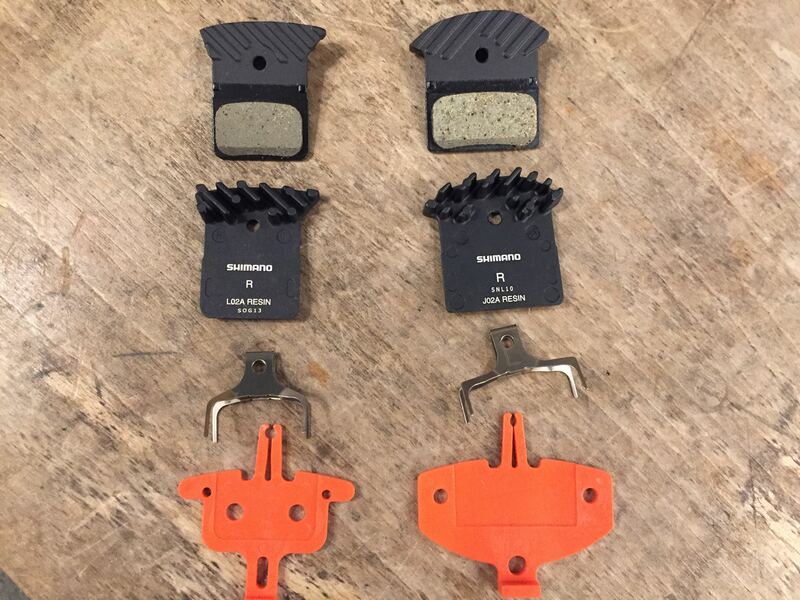 (Photo E) Shimano flat-mount vs post-mount brake pads. Note that for these models, the flat-mount pad is smaller than the post. Next Next post: What A Save!